Cement hardened just fine but there was still some prep work to do before the roof could go up. All the insulation (remember I told you it was like leggos?) had these little nubs-like things on the top. So I had to cut/pop them all off all the way around. If they popped off that was great – unfortunately most had to be cut or trimmed off. My razor knife worked best for the job but played hell on my fingers, especially my knuckles! Took about 3 days to get it all scrapped off and as smooth as possible. Once the cement top was cleaned (yep – actually used a small whisk broom and soapy water rag to get it all pretty!) it was time to seal it from the weather. Took about another 5 days to get it all painted with a water sealant – the complete exterior and top. 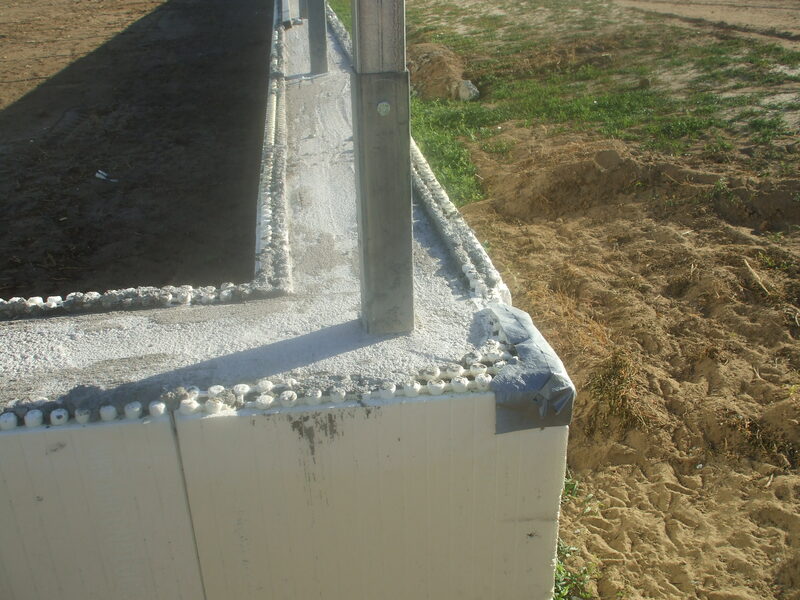 We will be burming the sidewalls (burying them under dirt) but they still needed to have the sealant applied. 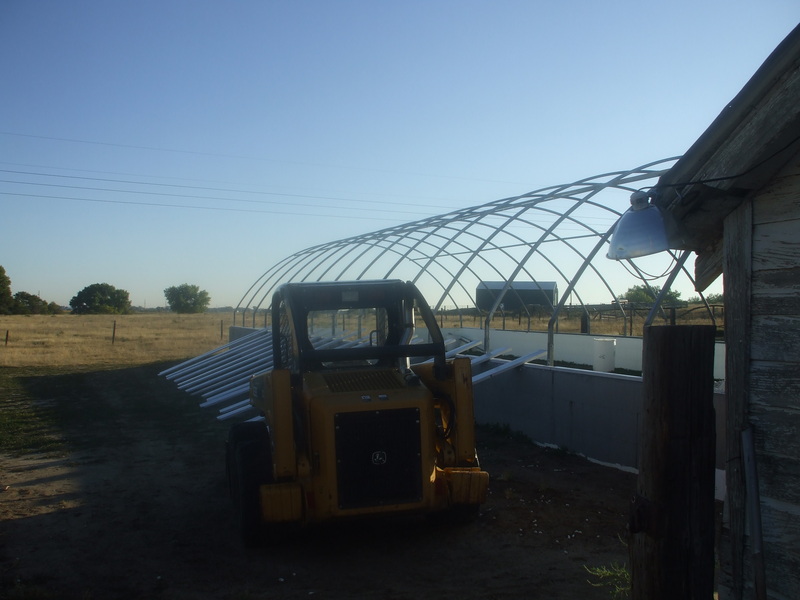 This will help them stay protected against the moisture accumulated in the ground that will be pushed up against them. 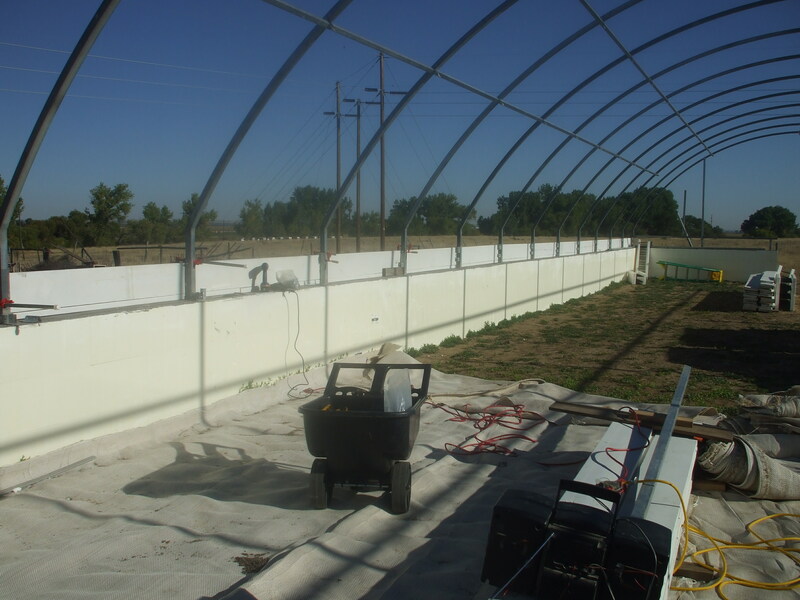 A small part of the wall will be exposed all the way around the greenhouse. We don’t want to have the dirt all the way to the top and even with the top of the wall, since winds and bugs are so wicked out here. We don’t want to give them any help sneaking into the structure. We left about a foot exposed on 3 walls (east, north and west) and the south side the dirt is even with the clean room floor. This left about 2 feet of space before the fans. The picture is what the numbs/bumps look like before I removed them. Notice how little room there is from the top of the cement to the bottom of the numb – it was about 1/2 an inch. After you can see how smooth and clean I got it. Notice that the north wall center is still open. This gave us easy access to put up all the frames, also to carry, by tractor, the heavy ground cloth we obtained into the area. This is also a good shot of the way the triple insulated wall works. The cement is in the center holding all the ribs with the extra insulation on the inside and out. We have already buried the footer in this picture, so you can’t see that there is still another foot below ground supporting all this. After the boards were all prepped the needed to be mounted. This was a killer on the shoulders and arms. I can drill into wood with no problem, but they also needed to be attached to the metal and cement – that was the tricky part. One 2”x4” board was laid flat, then a 2nd 2”x4” board was placed up right on top of that one pushed up against the ribs. That was bolted to the ribs and then to screwed to the 2”x4” below it. Once those were in place, the 2”x10” boards were set on top of that and attached. Drilling into the wood sections was easy, attaching them to the metal ribs was the shoulder/arm breaking process. Since there were no pre-drilled holes for any of this process, sheer pressure had to be applied to force the screws into the metal – lots of fun! It was just me doing all of this. The boards are 16 feet long and I am only 5 feet 5 inches tall – pretty sure this was a very funny sight to see. We did find and interesting tid-bit though. It had rained a bit and at nights moisture would build up on the ribs. When I was drilling into the metal pieces water started shooting out at me?! We finally figured out that we needed to seal the tops of the post to stop the water from running down the ribs and accumulating in the posts – that’s where all the water was coming from – inside the footer posts! Funny how little things like caulking the spots where the metals meet was never mentioned in the blue prints? Imagine if someone had not done the type of walls we did (which most do not) and they didn’t know this could occur – they could have water damage in the pipes and lose structure integrity ahead of schedule! That would be sad considering the price you pay for these things. It’s all in the details! These wood sides on top of the cement wall needed to be put in so we will have a place to attach the double poly-ply roof too. There are special clamps that will be attached to the wood to hold the plastic cover in place. Once I got all of the wood done, I had to go back and attach the guide rails for the clamps to the wood. All of these had to be in as straight a line as possible and at about 2” from the top of the wood. I also had to make sure there were no splinters or sharp edges that could possibly rub against the plastic cover. In between doing all the boards, we had found some great stuff to use as our weed barrior in the greenhouse. It was all free for the taking, weighed a ton, had to be cut into sections to move it and then stretched out over the ground. Cutting alone used up a number of knife blades as the stuff was very thick. It’s made out of the exact same materials that ordinary weed barrier (like the stuff you use in your own yard) except that it’s made thicker. It allows water to flow through, but no weeds to pop up – great stuff and it was free for the taking! Gotta love the price! 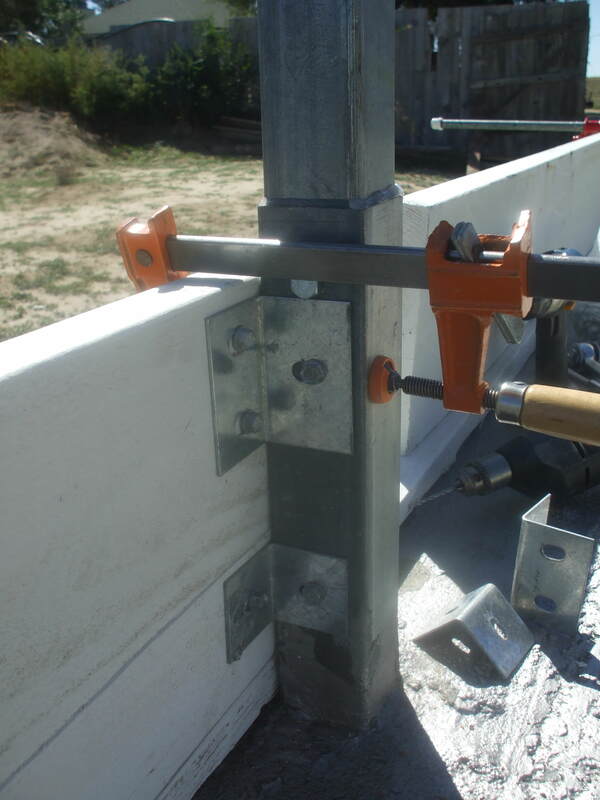 ← WORKING WITH METAL ON 100+DEGREE DAYS-OUCH!